When teachers, students and staff practice proper school parking lot safety, it makes it easier to keep everyone safe. School parking lots can be incredibly busy places in the morning when children arrive and in the afternoon when it's dismissal time. Ensuring that no one gets hurt is a primary concern of the school staff, but it requires everyone's participation, including parents. While the first few days of any new school year can be chaotic, mornings of any school day can be incredibly busy. Parents may walk or drive their children to school; buses will be arriving to bring kids. Administration or teachers often oversee the students' arrival to ensure that everyone is following the rules to make the mornings smooth and trouble-free. A lot of school systems have rules in place to keep students safe. They may have car lines, where designated areas are set aside specifically for parents to drop their children off. If parents walk their children inside, there should be adequate parking spaces as well as plenty of room for parents and their kids to walk without worrying about being in the way of traffic. Buses will arrive in droves. Usually, there are lanes set aside where buses line up and drop off children. Because of this separation from the car lines, it's normally easy for students to leave buses and go directly to where they need to be. 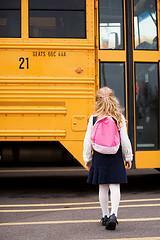 Now the focus is on getting children onto buses, into cars or to their parents or guardians. Bus riders will normally wait in one area while car riders may wait in another area. Teachers may assist children in getting to the right vehicles. Some schools adopt a sign system, so that parents can write their last name on boards or signs and prop them on the dashboard to be easily visible. This way, teachers and staff can see which children belong in which cars. Depending on whether it's an elementary, middle or high school makes a difference in just how much supervision is necessary. While young kids may need constant watching, high schoolers can sometimes require just as much supervision to stay out of trouble. There are guidelines that parents and students should follow for school parking lot safety. While these rules may differ from school to school, adhering to these general guidelines will keep anyone safe on school grounds. Parents should tell their children to look both ways in the parking lot. Even though it might not be a street, cars and buses are coming and going, so looking left and right for traffic is important. Schools should have a sign policy or similar policy in place so that children go home with their parent or guardian and not a stranger. Bus lines and car lines should be separate. Car lines should be for drop-off only. If parents need to get out and walk their children in, they should park the car. This keeps the car line moving smoothly and efficiently, an important consideration if the lane backs out into a busy street. Plenty of adult help should be on hand to help children, whether it's teachers, school administration or volunteer parents. No running, horseplay or goofing off should be tolerated in the parking lot. When you're dealing with hundreds, perhaps thousands, of children every day of the school year, making sure that everyone arrives and departs safely is a huge job. That's why everyone should be involved, from the adults all the way down to the kids. Many schools have volunteer programs in place for parents; parental involvement should always be encouraged and helping out in this way is a great way for moms and dads to know what's going on at their child's school. With a team effort, students can come and go without worry and that makes it easier for them to focus on what they come to school for: learning.